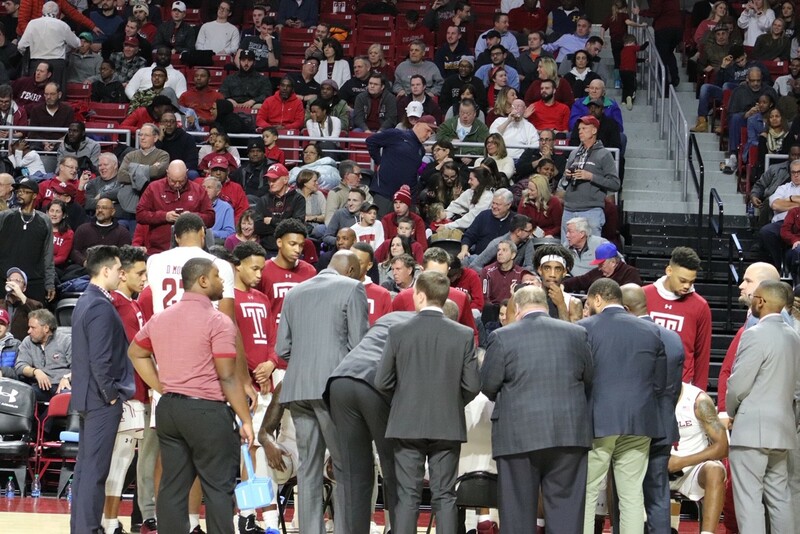 The Temple Owls faced defeat in the quarterfinals of the AAC Tournament on Friday. Third-seeded Temple lost to the sixth seed, Wichita State, 80-74. The Owls will now have to wait until Selection Sunday in order to know their fate in the NCAA March Madness Tournament. Wichita State’s Markis McDuffie scored nearly half of his teams’ points as he led them to the win over the Owls. Temple could not contain McDuffie as he scored 34 points in their big win. He helped them stay ahead of the Owls, hitting four free throws late in the contest to edge them to the win. Temple started off hot but could not contain Wichita State in the second half. They led at the half, 37-35, but McDuffie and the Shockers were able to take advantage of some empty-handed Temple possessions, and eventually take the lead with 17 minutes left. The Owls were poised to come back, led by Shizz Alston, Jr. and Ernest Aflakpui who had great games. Alston ended with 20, and Aflakpui ended with 16, mainly coming from his monstrous first half. The Owls kept it close, helped by Quinton Rose, who hit a few layups down the stretch. With 3:41 left in the game, J.P. Moorman II hit a clutch three to bring the Owls within striking distance, 71-68. However, a few fouls and great defense allowed the Shockers to pull ahead. Each time the Owls got close, the Shockers were able to contain the Owls sharpshooters, mainly Alston. Nate Pierre-Louis had a few opportunities to get a couple of layups to go, however, the Wichita State defense was all over him, causing the Owls to drop the game by six. In such a tight game, the Owls turned the ball over 15 times. While they did turn it over just as many times as Wichita State, they had to limit that if they wanted a chance to win. Additionally, the Owls only shot 73.1 percent from the free throw line, while the Shockers hit 91.7 percent of their attempts. The ability for the Shockers to hit their free throws with ease was a contributing factor in why they were victorious. The Owls needed to win against Wichita State in order to get their bid in the NCAA March Madness tournament. However, just because they lost, does not mean they are completely eliminated. There are a few different scenarios for the Owls, and they will have to wait and see what happens. The Owls will definitely be playing another game this season, it is just unclear whether it will be in the NIT Tournament or the NCAA March Madness Tournament. Coverage will be provided regardless of the scenario for the Owls.